The protein shake diet is becoming more prevalent here on the Florida beach. Guys looking to burn belly fat and build lean muscle are now bringing thick protein shakes in their coolers. Although protein is the motherlode of fuel sources for building rock solid muscle, there is much misinformation tied to it...and there is an overload of sheer stupidity connected to protein shakes. Before you read any farther, burn this into your brain: There is NO fat loss secret involving the ingestion of protein shakes. Similarly, there is NO muscle building secret that involves sitting in a beach chair, sipping a protein shake. If you are looking to burn belly fat and build lean muscle mass, you must do it the Old School way...through optimal nutrition, strength training with weights, and intelligent interval workouts. Please don't misunderstand me. There are true and solid benefits to protein shakes...it is just hard to find those benefits when you hear so much nonsense at gyms and beach bars. * Although protein is the primary source of nutrients for building muscle, drinking a shake with protein powder does NOT mean that concoction goes directly to your biceps or pecs. * Your body can only metabolize so much protein. The "leftover" does not magically vanish. It is broken down...and stored as fat. * Adding protein shakes to your diet does NOT automatically add muscle mass to your body. * ONE protein shake should last your entire day. Sip it gently over an 8-hour period, not gulp it down in a beach chair. * You will NEVER burn fat or build muscle mass by just sitting and drinking protein shakes. If that was true, everyone would be doing it...and we'd all look like Hercules. 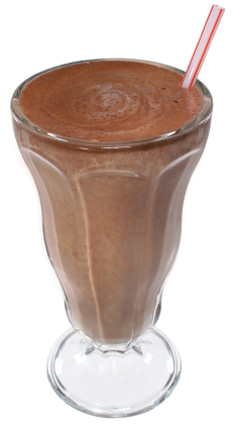 * A protein shake diet must be combined with intense weight workouts and interval training. Muscle cells must be broken down in order to be repaired and become stronger. * Solid protein sources such as chicken breasts, turkey, and fish give much better results than shakes. Solid sources will satiate your hunger, where as protein shakes go down so easily, guys overload themselves. And end up GETTING FAT, not muscular. * Soy is an outstanding source of protein, but many guys consider it "girls' protein." They miss out completely on its solid results. Soy protein does NOT lower testosterone, nor does it sabotage muscle mass. 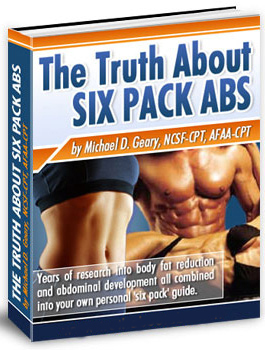 The Truth About Six Pack Abs is the best-selling program on the Internet for getting rid of male belly fat and building lean muscle mass. * Author Mike Geary focuses on: quality nutrition, whole-body strength training routines with weights, and purposeful cardio that includes interval training. * He sees no need for expensive (and worthless) supplements. * He tells you exactly how companies that manufacture protein powder (and other more phony supplements) laugh all the way to the bank with your money...while you get little results. * Mike lets you know that it is mental toughness and a commitment to solid nutrition that helps you build bigger muscles and lose belly fat...not a secret fat loss diet involving protein shakes. It is no secret that chicks are turned off by male belly fat. They want guys who have the lean "Hollywood/Olympic athlete look." If you are planning a Florida beach vacation and want to look tight and muscular so you can meet more women, The Truth About Six Pack Abs will help you much more than any protein shake diet.